Lock in a great price for Hotel u Sladka – rated 8.4 by recent guests! The location is perfect for wandering the streets of Chodovar Plana. This is in the Chodovar Pivovar complex so everything we wanted to see was right there. There is also a very nice park nearby. The minibar had the most reasonable price for a dark beer at only 25 CSK! Was nice to partake in a bottle after a long day. Il complesso: hotel, ristoranti, birreria (fabbrica) e la location ! Uns hat es dort sehr gut gefallen.Das Frühstück war gut ,Personal war nett .Schwimmbad u Wellness waren ausgezeichnet. Kommen sehr gern wieder,haben uns gut erholt. Sehr gutes Fruehstueck, sehr gutes Restaurant, Einrichtung etwas outdated, sehr kleine Dusche,kein kostenfreies Parken, Rezeptionist beim Checkin erinnerte mich mehr an Kasernenton als an Dienstleistungsgewerbe. Trotz Belegung eines Doppelzimmers mit nur 1 Person wird DZ-Tarif berechnet. Die Füllung der Minibar mit Haustrunk der Brauerei zum Vorkosten. Sehr schönes Hotel mit leckerem Essen und Bier direkt aus der hauseigenen Brauerei. Sehr empfehlenswert ist auch das Bierbad. Im Ort selbst gibt es außer der Brauerei nicht viel, aber für einen Zwischenstopp nahe der Grenze vor der Heimfahrt ideal. Modernes Hotel in historischen Ambiente. Schöner Spabereich. Unbedingt das Bierbaden ausprobieren. Hotel u Sladka This rating is a reflection of how the property compares to the industry standard when it comes to price, facilities and services available. It's based on a self-evaluation by the property. Use this rating to help choose your stay! 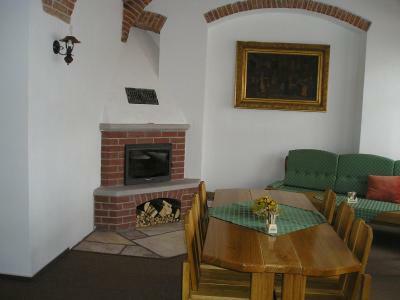 Hotel u Sladka is located in Chodová Planá, in a complex composed of a hotel, the Chodovar brewery and a wellness center. 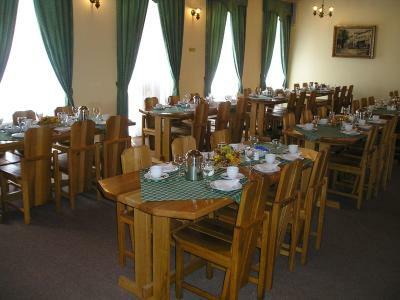 2 restaurants serving Czech cuisine can be found on site, while an indoor swimming pool is free for use for all guests. All rooms feature a TV, a mini-bar, a work desk and a private bathroom with toilet. Wi-Fi is available in all rooms, while private parking can be found on site for an additional cost. Among other amenities in Hotel u Sladka are saunas and steam baths, beer spa (with beer baths and beer massages) and minigolf facilities. Tennis courts are 650 feet away. The Ve Skále restaurant is a stylish venue with a small brewery museum, located in a part of a unique stone labyrinth in a 800 year-old brewery cellars. Skiing can be enjoyed in Ski Area Mariánské Lázně, 5 mi away. The spa town Marianské Lázně can also be reached in 5 mi. It also features a Royal Golf Club. Mining museum Planá is 2.5 mi away, while Monastery Teplá can be reached in 9.3 mi. A small airport called Skláře can be reached in 3.1 mi and organizes sightseeing flights. Train Station in Chodová Planá is 0.6 mi away, while the bus stop is 50 feet away. When would you like to stay at Hotel u Sladka? Room featuring a TV, a work desk and a mini-bar. Private bathroom provides a shower and toilet. Room overlooks the courtyard with a fountain or a church. Room featuring a TV, a work desk and a mini-bar. Private bathroom provides a shower and toilet. House Rules Hotel u Sladka takes special requests – add in the next step! Hotel u Sladka accepts these cards and reserves the right to temporarily hold an amount prior to arrival. I think we would have been happier on the backside of the hotel due to road noise. Lots of tractors and semis cruise the highway out front. Tiny single bed with water thin mattress. No aircon so had to open windows but as hotel is on a main road and next to a church that’s bells ring every 15 mins! Probably ok to stay if you are tiny, deaf and on a strict budget but not for me.